The Fullerton Loop is a popular ride in Orange County, but I first found out about it when I was exploring the Juanita Cooke Trail and saw a map posted next to the trail. It is supposed to be approximately 12 miles long, but so far I haven't gotten an accurate measurement. I found the map on the World Wide Web and used it to follow the trail. Of course, I went astray in a few places, but I've been able to piece together a description detailed enough so the next visitor can follow the route more easily. The map on the World Wide Web consisted of a marked up topographic map, part of the La Habra quadrangle. Unfortunately, this quadrangle was last updated in 1981, so it doesn't show many of the newer streets and other landmarks. A much more useful map can be obtained by marking up page 738 of the Orange County Thomas Guide, which doesn't show topographic features, but does show all the streets. The Thomas Guide is copyrighted, so I can't legally post a copy of that page. That would go beyond the bounds of fair use. But YOU can scan page 738 of YOUR copy and use my overlay to mark the trail on it. Try to use a resolution of 200 dots per inch, because this is the size that will fit the overlay. Then download the Fullerton Loop Overlay and use an image editing program to add it to the scanned map, adjusting the size if necessary. The Fullerton Loop is shown on the overly in green. Some of the side trails (but not all of them) are shown in blue. A border on the overlay matches the border on the Thomas Guide map and can be used for alignment. A topographic map with essentially the same overlay is also posted. It may be of limited use, because the topographic background isn't up-to-date. The usual starting and finishing point for the Fullerton Loop is the corner of Harbor Blvd. and Berkeley Ave. (H6). 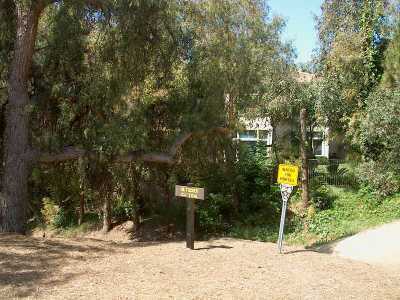 It has easy freeway access from the Harbor Blvd. interchange with Interstate 5, and parking is available at the municipal lot on nearby Valley View Dr. The loop begins on Berkeley Ave., just a short distance west of Harbor Blvd. Berkeley Ave. turns north and the path is on the west side. This is the south end of the Juanita Cooke Trail. The path is not signed, but it is fairly obvious. The south end of the Juanita Cooke Trail. Most of the Juanita Cooke Trail is fairly flat because it was built on an old railroad right of way. Follow it north across Valley View Dr. and N. Richman Ave. and turn left into the signed Hiltscher Trail. There are some benches at this trail junction, so it would make a good rest stop. The beginning of the Hiltscher Trail. Where the trail crosses Euclid Street, there are a few parking spaces on the east side. This street crossing is one of the most difficult, because Euclid St. carries a lot of traffic and there is no traffic light or other traffic control device. A culvert under Euclid St. is much too small to be passible. At the top of the hill, there is another small parking area, and the trail emerges on W. Fern Dr. approximately opposite W. Valley View Dr. Follow W. Valley View Dr. west all the way to its end. Turn right on Bastanchury Rd. and then left on Warburton Way. Bastanchury Rd. is a very busy street, but there is a traffic light with a left turn pocket at the intersection. Just before a railroad grade crossing, turn right and ride north next to the railroad tracks to the next grade crossing at Parks Rd. 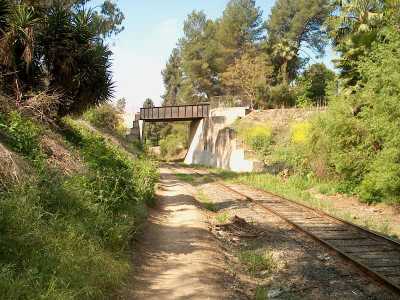 The Fullerton Loop runs next to a railroad between Warburton Way and Parks Rd. Turn left, cross the tracks and enter the Parks Trail, which runs next to Parks Rd. on the right (northeast) side. Follow the Parks trail north through Edward White Park, then past a school and through Roger B. Chaffee Park. to Rosecrans Ave.
Cross Rosecrans Ave. with care. It carries a lot of traffic, and there is no traffic light or other traffic control device. Enter Virgil "Gus" Grissom Park and follow a narrow asphalt path, which runs next to a drainage ditch. The Parks Trail through Virgil "Gus" Grissom Park is paved and next to a drainage ditch. The path emerges on Camino Rey. On the other side of the street, and a short distance to the right (east), an unpaved path runs north and soon turns west. It is not clear whether this is part of the Parks Trail, but it is surely part of the Fullerton Loop. The trail crosses Parks Rd. and enters the West Coyote Hills Tree Park, which is signed simply as "Tree Park". There are two trails through the park. To the left (south) is the higher trail, which is closed to bicycles because it contains a very steep hill. Bicyclists must follow the lower trail. When it leaves the park, it runs right next to Coyote Hills Dr. For a short distance you will have to ride on the sidewalk because there is no unpaved trail. The Rosecrans Trail has paved and unpaved parts. 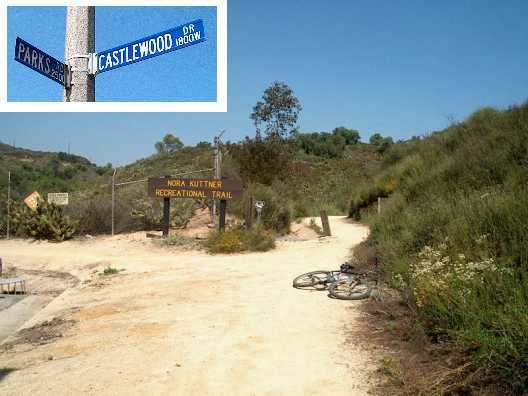 Where the Rosecrans Trail comes to an end, the signed Castlewood Trail begins. It runs north and east around a residential area, coming quite close to the streets in some places. 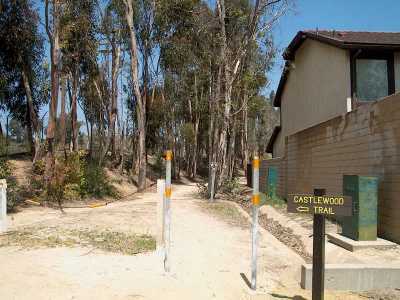 The Castlewood Trail begins where the Rosecrans Trail ends next to Rosecrans Ave.
At one point, a side trail veers right (south) and descends to N. Gilbert St. The main trail continues and reaches N. Gilbert St. near Chantilly Lane. N. Gilbert St. is a busy street, but there is a traffic light with a pedestrian signal that bicyclists can use to cross safely and easily. The trail continues west along the north side of Castlewood Dr.
Where Castlewood Dr. meets Parks Rd., turn left (north) into the signed Nora Kuttner Recreational Trail. The Nora Kuttner Recreational Trail begins at the corner of Parks Rd. and Castlewood Dr. The Noral Kuttner Trail runs east as far as Euclid St. There are good views of the Robert E. Ward Nature Preserve just to the north. The trail emerges on Euclid St. roughly a block south of Laguna Rd. The Bud Turner Trail, which runs north along the east side of Euclid St., is the next leg of the Fullerton Loop. However, there is no traffic light or other control signal at this point, and the Bud Turner Trail is disrupted by construction work (as of this writing on April 15, 2004). Most bicyclists will prefer to ride north on the west side of Euclid St. to the intersection with Laguna Rd. and use the pedestrian and equestrian signal to cross there. 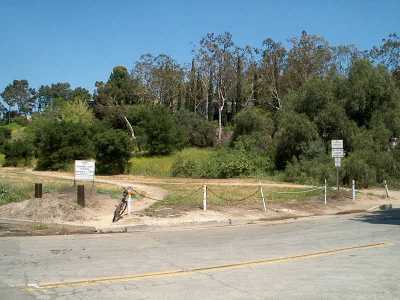 The Bud Turner Trail enters the Laguna Lake Park on the north side of Laguna Rd. a short distance east of Euclid St. and opposite Yuma Way. 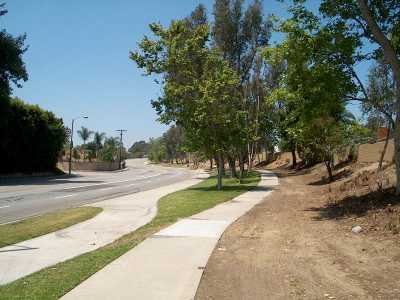 The Bud Turner Trail enters the Laguna Lake Park on Laguna Rd. The trail crosses Clarion Dr. and then runs northeast next to Laguna Lake. It appears that the trail runs along the southeast side, although there is also a trail along the northwest side. Turn right and follow the Juanita Cooke Trail south until it crosses over a railroad (part of the same one you followed earlier). On the south side of the railroad, turn left and descend steeply to the railroad. An old railroad trestle carries the Juanita Cooke Trail over a railroad spur. The path near the tracks is part of the Fullerton Loop. Follow the railroad east, passing under N. Harbor Blvd. 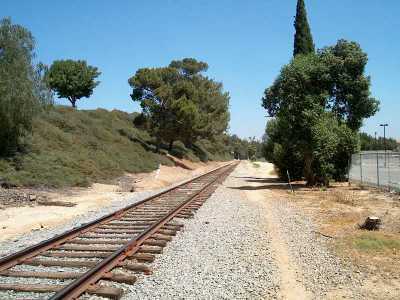 Be careful, because the path runs quite close to the tracks in some points, and freight trains do run on this railroad. Turn right onto a side path. (If you come to a grade crossing, you have gone too far.) 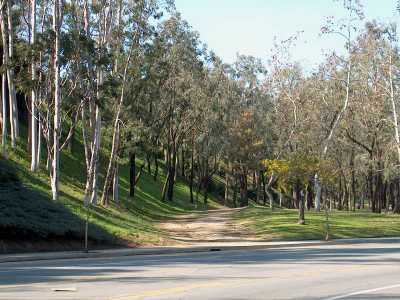 The path runs next to a paved road for a short distance and then crosses over the road to run next to the Fullerton Golf Course. 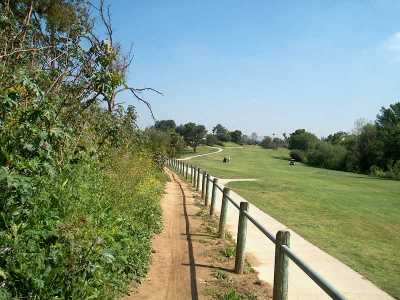 The Fullerton Loop runs next to the Fullerton Golf Course. At the south end of the golf course, the path runs through two large culverts under Bastanchury Rd. On the other side is the Brea Dam Recreational Area. 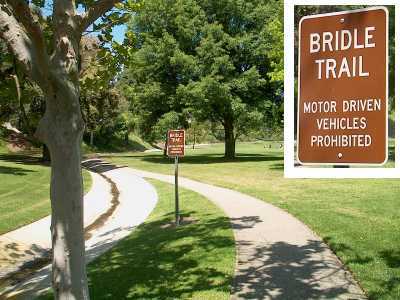 There are quite a few trails, both formal and informal, through the Brea Dam Recreational Area. If you head generally south, you won't get lost. After passing under Bastanchury Rd., the trail splits. The easier route is to the right (west). Follow it south until you come to the Brea Dam, and then turn right and ride next to the dam up to the northwest side. The easier branch of the Fullerton Loop runs up the edge of the Brea Dam. The more difficult route is to the left (east), and it may be closed if access to the dam is ever shut off. The trail leads directly to a four-way intersection of trails. Do not turn left, because this is a side trail that leads away from the dam. Go straight ahead. 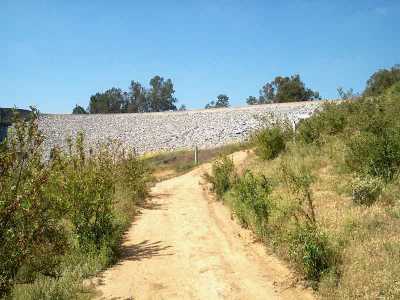 When you approach the dam, you will notice two gravel roads leading uphill and to the left. Take the second road (although the first probably goes the same place) up to a large clearing. Turn right and follow the road up to the dam. There is a pipe gate across the road, but it is unsigned and easy to pass through or over. Then cross the dam to its northwest end. There is another gate at the end, but you can get around it by lifting your bike over a low wall. Either of these routes will take you to the parking lot for the Fullerton Tennis Center. Go west along E. Valencia Mesa Dr. to Harbor Blvd.